Graduating medical students at Emory University School of Medicine gathered on campus for the highly anticipated moment when they discover where they will train as residents. Students simultaneously opened sealed envelopes in the presence of friends and family during the suspenseful annual Match Day ceremony. The participating Emory students were among thousands nationwide who applied for residency positions at US teaching hospitals through the National Residency Match Program (NRMP) that annually matches students with residency programs. They joined approximately 16,000 US medical school seniors to learn where they will spend their years of residency training following graduation. 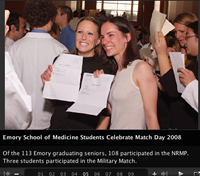 Of the 113 Emory graduating seniors, 108 participated in the NRMP. Three of the graduating students participated in the Military Match. In addition, one student will be graduating with a dual MD/Oral Maxillofacial degree and is currently in a residency program, and one student is deferring residency. Thirty-six students will spend all or part of their residencies in the State of Georgia in Emory's Affiliated Residency Training Programs. "The results of this year's residency matching demonstrate once again the strength and caliber of medical students educated by Emory University School of Medicine," says J. William Eley, MD, MPH, executive associate dean for medical education and student affairs, Emory School of Medicine. "These new graduating physicians will be trained in prestigious programs across the nation and in a diverse variety of medical and surgical fields," says Eley. Some of the most popular specialties chosen by Emory's graduating seniors include Internal Medicine, Pediatrics, Anesthesiology, General Surgery, Diagnostic Radiology, Family Medicine, Ophthalmology and Neurology. Their training will be at such prestigious institutions as Emory University, Harvard, University of California -- San Francisco, University of Washington, Cornell, Washington University and Columbia.